This afternoon I participated in a chat room style Q & A with the director and producer/star of Margin Call, J.C. Chandor and Zachary Quinto following a screening of the film. While none of my questions got answered (although a few very similar ones did), here is a transcript of our discussion. Producer, Zachary Quinto, and Writer/Director, J.C. Chandor on the set of MARGIN CALL. Do you think that the film opening on a week when Occupy Wall Street is all over the news helps your marketing efforts? J.C Chandor: I'm not sure. We'll have to see. It's certainly rewarding - it takes many years to make a film. I started writing about 3 years ago today. To be able to introduce a film into that environment is very rewarding. Whether it will help from a box office standpoint, we will have to wait and see. We wanted to give the viewer an entertaining look into this field. Hopefully it will give the viewer a greater understanding of who we're protesting against. Did you have a specific article or incident that inspired you to create this film? J.C Chandor: No, there were several incidents that came together throughout late 2006, into 2007 and then into 2008. It wasn't only one article. We were trying to make a somewhat universal bank in the film - so it was representative of many banks. That also goes for many of the characters. None of them were based on one particular person. Zachary, why did you pick this film as your first feature film as a producer? Zachary Quinto: I started a production company three years ago and I thought the script was fantastic. Zachary, to prepare for your role in the film, I heard you spent a few weeks shadowing a few Wall Street workers at Citibank. Were they initially skeptical or hesitant to allow you to do that? Zachary Quinto: The Citibank workers were really supportive and really available. They were able to help myself and the other actors. Zachary is this the first film your production company has produced? Do you think this film talks down to it's audience too much? I'm citing the line "Speak to me as you would a young child or a golden retriever." Zachary Quinto: Jason: I like how it handled the subject matter; I liked how it drew me in. I thought it was really compelling material. And I don't think the film talks down to the audience at all. It's to great effect that the characters are less adept at understanding the complexity of the financial models that they're talking about. What would you tell a person the reason to see Margin Call? J.C Chandor: I would say a reason to see Margin Call is hopefully it entertains you for an hour and a half. We tried to make a compelling drama. The second thing is we tried to do is give the viewer insight into a world they are not normally privy. A world not normally available to them. What are the challenges of marketing a film about an unsympathetic company taking advantage of people? J.C Chandor: You don't have to like everyone in the movie. This is about coming into a world where you really aren't supposed to like everyone in it. Tuld's speech about winners/losers, that the percentages stay the same. Given the current climate (even though it's Tuld's statement), can you still attest to that rationale? J.C Chandor: Every character is human. In the same way a horror movie can be entertaining and fun, you are with these people in their every day professional lives. You see it from a different point of view. The fun thing about writing a film is you don't have to agree with everything every one of your characters says. The budget posted on Wikipedia seems quite small for the talent on the project; if so, did the actors participate because they believe so much in this project? J.C Chandor: The cast was an unbelievably great surprise. I sat down and wrote this script with the idea of directing it myself. I wrote it with a tentative budget in mind of under $1M. After Zachary's production company got involved, we started to send it out to actors and the response was overwhelming. The challenge of getting all these people to show up to make the movie, we one by one locked people in after they responded to the script and agreed to work with us. It was a 17 day shoot, which was very very short in the world of filmmaking. This allowed us to not have to require the actors to be with us for an extended period of time. This also helped us in landing actors with very busy schedules. These actors really believed in the project. It made it that much more rewarding. What about the GLENGARRY GLEN ROSS comparison with the movie? J.C Chandor: Not so many Glengarry Glen Ross comparisons. The film seems to be taking on a life of it's own. Do either of you plan on visiting any of the Occupy movements around the country? J.C Chandor: I have gone and visited the NY Occupy site. It's very inspiring that people are actually out in the street having their opinions be heard. Jeremy Irons acting alongside Spacey was magnificent. What specifically about both of those actors played a part in casting them? J.C Chandor: I believe both of those actors turned in performances that as a writer and director are all you could ever dream of. To think back, before we shot the movie, it was actually a bit of a risk at the time to cast Kevin in a role that is essentially for much of the film supposed to be quite empathetic with the audience. In the past, it might have been more typical to cast him as the CEO. But Kevin came in and inhabited that character and made it his own. I heard that you wrote a first draft of the script in just 4 days, between job interviews. That's pretty impressive, can you talk about that? 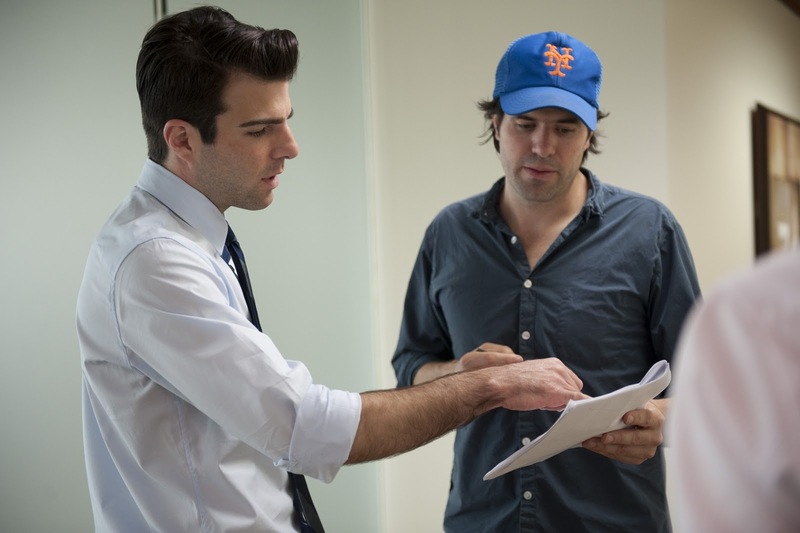 J.C Chandor: Yes, I had the idea for the script and had been working through it for over a year. But the way I like to write is have an idea not fully formed, but fully researched and thought through before I sit down to actually write it. In this case, I had been working on the story off and on in my mind for over a year and finally sat down and wrote the line by line script in just 4 days. I then went back and made many additions and revisions but for the most part, almost all of that 81 page draft is in the final product. I’ve never written anything else that quickly before and probably won't again. But this was a script that at that time, I was clearly ready to write. Did the short shoot also help the actors not know each other so well which fits because Zachary's character and the other young guy did not know the heads of the company that well? J.C Chandor: Absolutely. Whenever you're shooting a low budget film, by it's very nature, there are going to be many hurdles and barriers due to limited resources. What I always try to do as a filmmaker or writer, no matter the budget, is to use your weaknesses and try and turn them into strengths. In this case, I had a story about very intelligent, Type A people who are trained to never show panic. I was working with highly intelligent, very accomplished actors who also rarely ever panic on a job at this point in their careers. But the pace and scope we were having to shoot in such a limited time period, created an environment that at times even put these accomplished actors through what I later realized was a mild, low-level sense of panic under their performances. Which are used, hopefully, to great effect to express what their characters were feeling as well. Margin Call is one of several films recently being released on VOD; what are your thoughts on the importance of a film such as this reaching as much of the American population as possible? J.C Chandor: I'm very excited to see where this experiment ends up. No one quite knows in this current market/environment what the best way is to distribute the film. But we are getting a 60/70 city release theatrically. For a small budget film, that is a very exciting release. To add to that, most major markets and many smaller markets can view the film on VOD. That's exciting to get the film out to the widest audience. I always believe the best experience is in a theater, but I also have 2 small children and know going to the movies can be a complicated and expensive endeavor so it's nice to know this film is going to get it's widest audience possible. MARGIN CALL opens Friday, October 21, in select cities and On Demand.